Disco Corporation is a manufacturer typically found in the Semiconductor Industry, focusing on precision tooling. Headquartered in Tokyo, the Japanese manufacturer is most known for making dicing saws and wafer grinders, used for manufacturing semiconductor wafers. 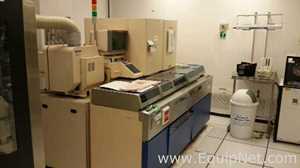 EquipNet is constantly receiving used Disco Corporation equipment through our exclusive contracts with our clients, who are global leaders in the Semiconductor industry. Our inventory of used Disco Corporation equipment includes a number of Wafer Die Saw, Wafer Grinder and more. If you do not see the used Disco Corporation equipment you are looking for, call one of our representatives and we will find it for you. We can also source the right tooling and change parts that you need through our huge network of corporate clients from around the globe. Disco Corporation manufactures a wide range of fully automatic and automatic Wafer Die Saw for cutting semiconductor wafers. EquipNet carries a range of used Disco Corporation equipment, including fully automatic dicing saws.